The following is a case summary of the above-captioned matter. A full opinion, concurrence, and dissent by the appellate court justices can be found by clicking here. You can also check out this week’s review of the most important California Case Decisions here. Subsequently, Emanuel, on behalf of himself and others similarly situated, brought a class action lawsuit against the Lakers alleging that the Lakers sent the response text message using an “automatic telephone dialing system,” in violation of the Telephone Consumer Protection Act (“TCPA”). The Lakers promptly sought coverage from its insurance provider, the Federal Insurance Company (“Federal”), to defend it against the lawsuit. Federal denied coverage and declined to defend the Lakers, concluding that Emanuel had brought an invasion of privacy suit, which was specifically excluded from coverage. After asking Federal to reconsider its position, the Lakers sued Federal for breach of contract and tortious breach of the implied covenant of good faith and fair dealing, asserting that Federal had violated the Policy by denying coverage for the Emanuel lawsuit. After removing the suit to federal court, Federal filed a motion to dismiss the suit for failure to state a claim under Federal Rule of Civil Procedure 12(b)(6). The District Court granted the motion and dismissed the case without leave to amend. 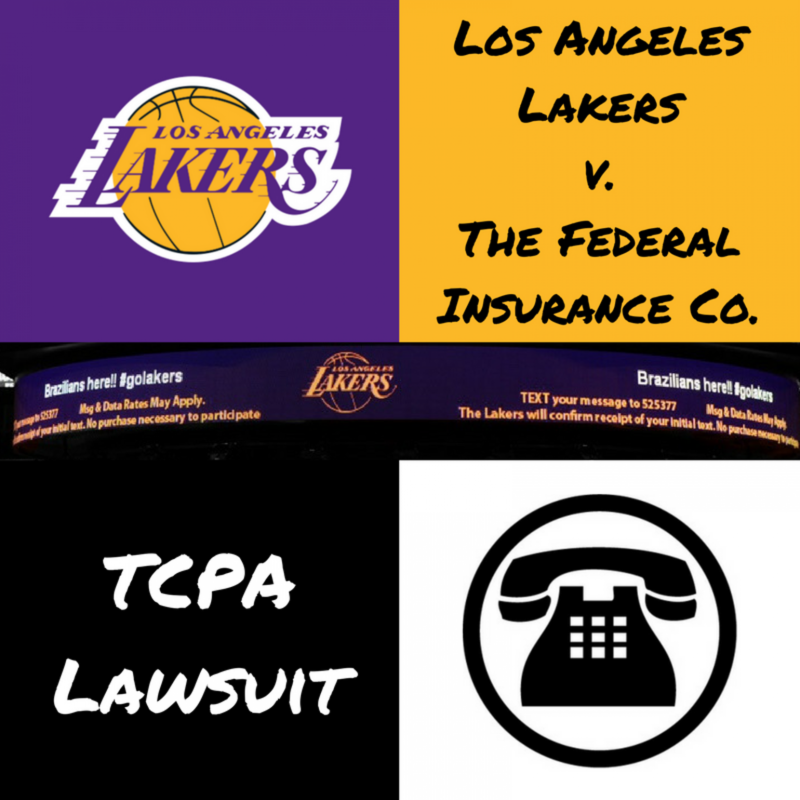 The District Court found that the Lakers could not succeed in the suit under any cognizable legal theory, because TCPA claims are “implicit invasion-of-privacy claims” that fall squarely within the Policy’s “broad exclusionary clause” which specifically provided that “[n]o coverage will be available” for a claim, based upon, arising from, or in consequence of libel, slander, oral or written publication of defamatory or disparaging material, invasion of privacy, wrongful entry, eviction, false arrest, false imprisonment, malicious prosecution, malicious use or abuse of process, assault, battery or loss of consortium[. ]” The Lakers timely appealed. The Court of Appeal affirmed the District Court’s dismissal, holding that because a TCPA claim is inherently an invasion of privacy claim, Federal correctly concluded that the underlying TCPA claims fell under the Policy’s broad exclusionary clause. Accordingly, Federal did not breach the insurance policy, or the implied covenant of good faith and fair dealing, under any cognizable legal theory, when it declined to defend against or cover the underlying complaint.